Celebrate the end of the school year and the arrival of summer with a Kids-Get-in-Free Week at Genesee Country Village & Museum. Starting Tuesday, June 27, through Sunday, July 2, all kids 16 and under will be admitted free to the Genesee Country Village & Museum. 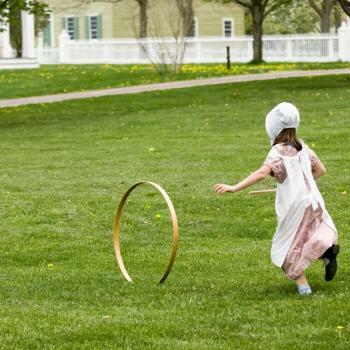 During that week, there will a special focus on youth activities throughout the Historic Village, from games—including some little-known today— to gatherings and activities a 19th-century youngster would have experienced. Young visitors can test a two-man saw and other long-ago chores like stoking fires, carrying wood and grating kitchen spices. In addition, there’s the museum’s new lambs and the powerful oxen team to meet as well as a 19th-century classroom to attend and a cooper to chat with as he crafts wooden buckets. Kids can learn to knit, punch a tin design, see how they would be been instructed to behave in the 1800s, be amazed at Professor Lowe’s “magic gas” and treated to the sounds of a glass harmonica. There are nature trails to hike and a gallery with western art and historic clothing to explore and where, in a new photo booth, they can become part of popular works of art. On the weekend there will historic baseball played by 1868 rules at Silver Base Ball Park, the only recreated 19th-century base ball park in the country. The event is sponsored by the Polisseni Foundation. General admission is $18 adults; $10 youths 4-18; $15 seniors 62+ and students with ID; free to children three and under. Special event admission is $22 adult; $14 youths 4-18; $19 seniors 62+ and students with ID; free to children three and under. For further information, visit www.gcv.org or call (585) 294-8218. GCVM is the largest living history museum in New York State with the largest collection of historic buildings in the Northeast. The museum, with its John L. Wehle Gallery, working brewery, vintage base ball and Genesee Country Nature Center, is open 10am-4pm Tuesdays-Sundays and located in Mumford, 20 miles southwest of Rochester and 45 miles east of Buffalo..